What is a Social Community Operator ? Social community operators use unlicensed bands and rely on the access points activated by subscribers who constitue a community of users. Relying on access points activated by users provides a viable alternative to the deployment of costly base stations and to the use of licensed spectrums for wireless communication. However, as the willingness of users to join such a community determines its evolution, there is no guarantee that the wireless social community network will reach full coverage in the whole service area. This willingness typically depends on various factors, such as the subscription fee, the network and service preference and the mobility of users. Presently, FON is the largest wireless social community operator. We developed a simulator to study social community operators, to evaluate different scenarios and to verify analytical results. The simulator supports any number of operators. Operators may start at any time, i.e., a social community may be set up after the evolution of another one. The tool, with high flexibility and good performance, simulates all possible scenarios of our model with high precision. Before beginning a simulation, Community Simulator generates a city map with an open source random map generator. 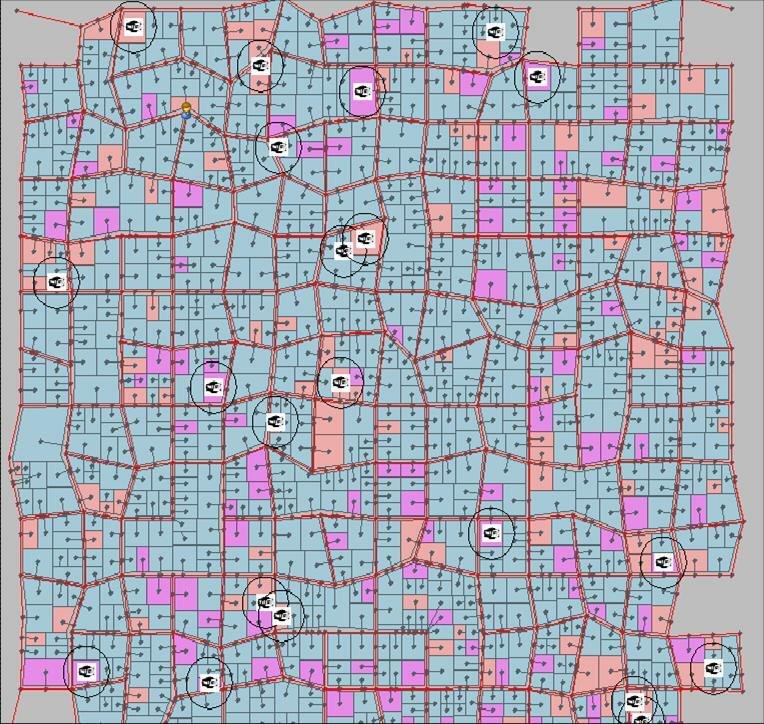 There are switches to change the generated map properties: size of the city, road density, adjacency distances of road nodes, map uniformity, road smoothness and building density. The parameters of the map generator are set to generate a 4kmx4km map. Community Simulator works with real time format yy/mm/dd:hh:mm:ss. The format was preferred to the cycle based timer, because mobile users choose their destination according to the time of day. Currently, you can download a demo of the simulator. The source code of the simulator is available here. 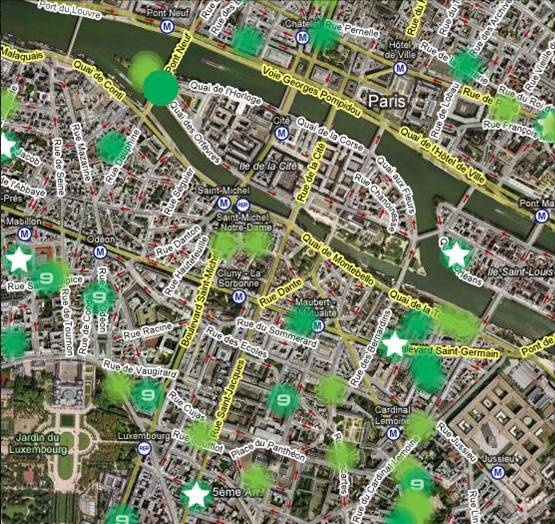 Fon Operator in Paris: Green circles show effective range of access points [http://maps.fon.com]. Community simulator with public places, workplaces and residential buildings. Social community operators negotiate with owners and managers of public places and workplaces to make their service observable for potential mobile users. Users subscribe or unsubscribe from the social community operator according to their observed coverage and the subscription fee of the operator at the end of each month. If a mobile user subscribes to a social community operator, he/she activates an access point in his home for the subscribers of his social community operator. Therefore, when more users subscribe to the community the observed coverage will increase and more users will subscribe to the community in the following month. According to different preferences of users for subscription fee and observed coverage, the pricing of the operator controls the evolution of the community. 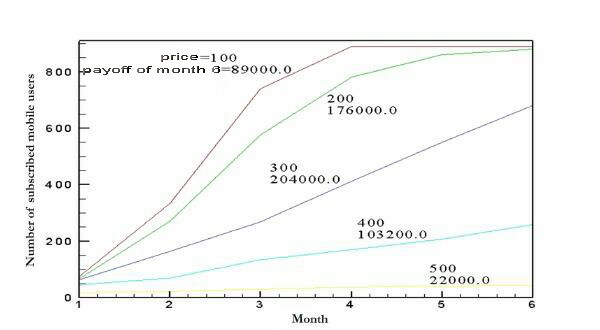 In the following Figure, we assessed growth of a social community operator for different static prices during a 6-month simulation. Growth of a social community operator for different static prices during a 6-month simulation. A. Mazloumian, M. H. Manshaei, M. Felegyhazi, and J.-P. Hubaux. Optimal Pricing Strategy for Wireless Social Community Networks. In ACM NETECON, 2008. M. H. Manshaei, J. Freudiger, M. Felegyhazi, P. Marbach, and J.-P. Hubaux. On Wireless Social Community Networks. In IEEE INFOCOM, 2008.